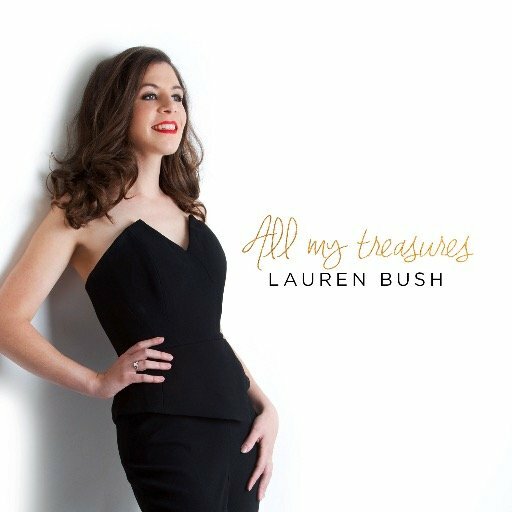 bebop spoken here: CD Review:Lauren Bush - All My Treasures. I've Got Just About Everything I Need: A Bob Dorough composition, arranged by Canadian bassist Don Thompson and Dunache, gets things moving. Imagine a combination of Blossom Dearie and Annie Ross and you're getting close. Track one and I can't wait to hear more! I'm Old Fashioned: Bush refers to hearing the song in Toronto - is she Canadian?. Brandon Allen has a fine blast on tenor, Dunache takes it out with a kind of spinet-like stride and, in between, Lauren rephrases the tune. Dindi: I have to confess this is one Jobim tune that doesn't register with me - having said that, this is probably the least worst version of this 'dingy' ballad. Apart from Bush's clever improvising, there's also some nice trombone from McLoud and I'm beginning to think it's not such a bad tune after all - although it would never make my top 12! Secret Love: Another song I invariably view with suspicion and, on this occasion, totally unfounded! A You're Adorable: An unlikely vehicle! But it's fun and she doesn't try to make it something it isn't. Brings back childhood memories for me too - but I shan't mention her name! I'm Gonna Sit Right Down and Write Myself a Letter: Knockout vocal, superb vocalese with the horns blending in with the vocal. Detour Ahead: Once again the Bush voice and the Allen tenor to the fore. Charade: Remember seeing the film centuries ago - Cary Grant & Audrey Hepburn. Not much of a film. Didn't think much of the song either - until today! Superb arrangement brilliantly sung with outstanding trumpet. Sweet Georgia Brown: We're on track 9 and I'm coming to the conclusion that Bush and the boys couldn't hit a bum note if they were paid to! The quasi-dixie section gives it a quirky touch. Put Lauren into a tight black and white dress and a picture hat and she could just about shade Anita! Doodlin': The Horace Silver classic is pure gold! Think Annie Ross and Twisted! You're Nearer: Voice and piano - Bush, inspired by Shirley Horn's version of the Rodgers and Hart classic and, I guess. pianist Dunache was too. Feelin' Alright: Ian Shaw, along with Dunache, did the arrangement with Shaw throwing in the backing vocal. Shaw also produced the album and Dunanche did all the arrangements on the disc. A credit to all concerned! * Softly as in a Morning Sunrise not on actual CD. Home counties? She's Canadian. Have heard a lot of her and always enjoyed it - a fine singer and a really nice person. And Liam's a great piano player.